These cedar benches were built by my father a number of years ago, after we took down a bunch of trees on the property, including some 100 year old cedar trees. After 3 years of weathering their original finish had worn through. Based on the success I had with our the cherry bench in the spring, I went to town on these this week. The one on the right is the state of the benches before being touched. The one on the left was after an hour with a belt sander. The cedar red color really jumped back out in the process. This is a look at the benches after the final coat of poly was put on. They are still drying, so there is some artifacting that won’t be there once it hardens. I’m very curious how long the deep red heart wood is going to stay that color, or if it will orange like cedar does when exposed to air. This print was bought at least 2 years ago, finally got around to building the frame for it. I’m pretty happy with how it came out, just need to sort out some hangers and it will be the new art up over my home office desk. 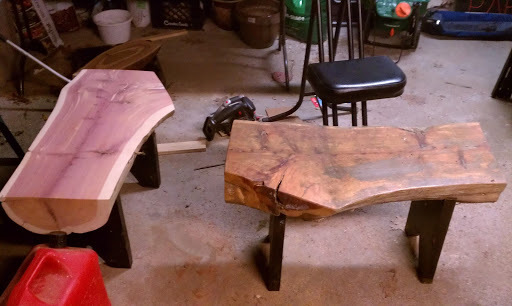 Besides picking 7lbs of blueberries this weekend, I also managed a lot of progress on 2 of my wood working tasks. This is my shot glass collection shelf, probably to be mounted tonight. 7′ 7″ long, 3″ wide, going up in our dining room. Oak with 2 coats of cherry stain. An outdoor coffee table created from extra top we had for our outdoor island. Legs made of poplar using my new kreg jig. Apparently I’m now writing a drupal drush module for patch management, and slowly understanding what that entails. I’ve looked around and surprisingly there really isn’t a good solution for this yet. There are a number of solutions for applying other people’s patches that are posted somewhere, but what I really care about is being able to easily keep, and reapply the dozen or so patches I’ve made to drupal modules to make mhvlug.org work. Some of these were due to bugs that don’t seem to be getting fixed any time soon. Some are due to lost of drupal modules not working with PHP 5.3. Regardless of the reason, I’ve apparently found a new itch to scratch, which hopefully isn’t going to take me too long, because I really need to get back to android hacking. While the room still has some work to do, the shelves are now complete. They’ll be full of stuff starting in a couple of days. For my first finish level of wood working, I’m pretty pleased how they turned out.